The choice of those with curls or hard-to-style hair. The unique formulation enriched with Dead Sea Minerals and Yarrow Oil. The oil is used in Style Curl Control is yarrow oil, valued for its medicinal properties, was used by the ancient Greeks to heal the battle wounds. The plant is rich in antioxidants and fatty acids that keep hair flexible, replenished, glossy, and conditioned, while ensuring a well-balanced, healthy scalp. Yarrow oil, imparts intensive moisture, nourishment and suppleness to the hair fibers. 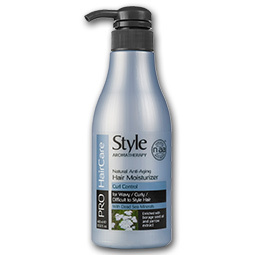 Makes hair easy to style while enhancing curls. Imparts luster and shine along with a wonderful fragrance.